My Life and Activities here in KSA..: Daily Routine in offshore..
Wake up at 5:30am,then after that..I'll go to bathroom..by 6am in the morning,hopefully I am in the clinic,doing my checklist,checking my instrument if it is still working or not, check e-mails in my outlook,get a cup of milk with coffee,bread and fried egg for breakfast.Report back to clinic,entertain patients on no patient at all the whole day.Since this is Ramadan time,we go for Lunch by 11am,usually our Lunch was at 12 noon.Our Dinner is now at 5am, too early and sometimes at 11pm,I am a little bit hungry..eowwwww...but right now..I am just sitting down in my clinic,without much nothing to do,just finish my report and I pass it last 2 days ago.. thanks for now, am not busy! 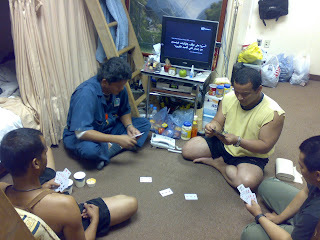 !Night time was our relaxation time,we play cards (Pusoy Dos)..usually I end up as losers because I am still learning the card game,but it's good..gradually I can improve my game the next time we play..maybe after a month..ha ha ha..then after that..we will watch news in my room,since most of my pinoy friends don't have internet access..this is the usual thing we do in offshore..after the news..it's about time to sleep..so the routine itself was so bored..it's like you are put in jail..Nakakaloka talaga ang buhay dito! !